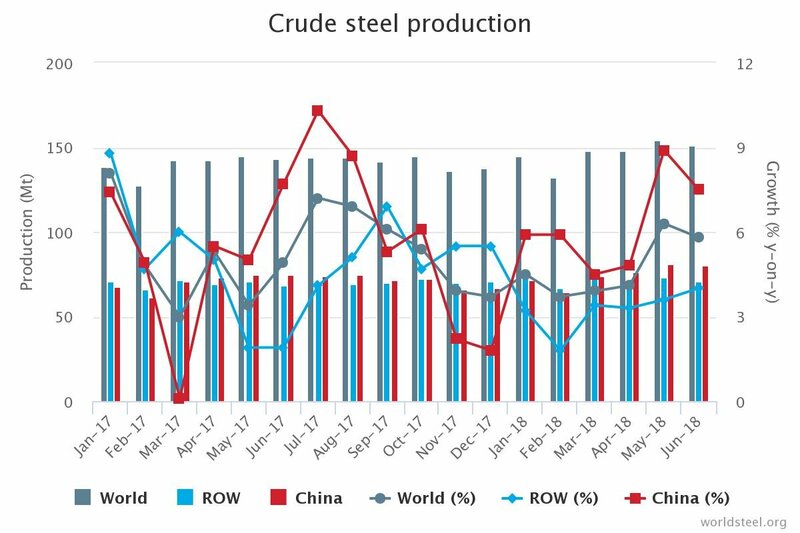 World crude steel production was 881.5 Mt in the first six months of 2018, up by 4.6% compared to the same period in 2017. Asia produced 613.9 Mt of crude steel, an increase of 5.2% over the first half of 2017. The EU produced 87.3 Mt of crude steel in the first half of 2018, up by 1.6% compared to the same period of 2017. North America’s crude steel production in the first six months of 2018 was 59.0 Mt, an increase of 2.4% compared to the first half of 2017. The C.I.S. produced 50.5 Mt of crude steel in the first six months of 2018, an increase of 2.8% over the same months of 2017. China’s crude steel production for June 2018 was 80.2 Mt, an increase of 7.5% compared to June 2017. Japan produced 8.8 Mt of crude steel in June 2018, up 4.2% on June 2017. India produced 8.7 Mt of crude steel in June 2018, an increase of 7.4% compared to June 2017. South Korea’s crude steel production was 6.1 Mt in June 2018, an increase of 3.2% on June 2017. In the EU, Italy produced 2.1 Mt of crude steel, up by 1.5% on June 2017. France produced 1.3 Mt of crude steel, a decrease of 4.4% compared to June 2017. Turkey’s crude steel production for June 2018 was 3.0 Mt, up by 0.7% on June 2017. Crude steel production in Ukraine was 1.7 Mt this month, up 7.5% on June 2017. The US produced 6.8 Mt of crude steel in June 2018, an increase of 0.8% compared to June 2017. Led by Western Europe, increasing regulations and bans against plastic bags and other single-use plastic items such as drinking straws is driving growing demand for biodegradable plastics, according to new analysis from IHS Markit. Recycling charity Recoup is once more supporting the plastics recycling industry via their support of the UK Best Recycled Plastic Product Award 2018.